What is Java Web Services? Basically web services are those which runs over World Wide Web (WWW) through a network communication system over internet to build a connection between client and server or vice versa. Web services provide some standardization sources to connect between software applications which run over variety of platforms and frameworks. Java Web Services is one the most recognized platform for web based applications development that is backed by object oriented programming originated from C and C++ languages. Java servlets are used as web based module and sessions development which also provide ease in running applications through server side scripting. Java Web Services are extensively used in application development of Java based technology tools and APIs which are easily configurable with web applications or web servers at variety of platforms. Java Web Services program of Brainmeasures is now an easy way to get knowledge and skills of using Java and Java servlets for web based programming and applications development. This is a versatile certification program that is especially designed to cater the needs of websites development, software compatibility with web applications and synchronization as well as harmony of web services across multiple platforms. This course of Brainmeasures is an online certification program which will enable you to become more proficient in web based programming and web based applications development. This certification program will equip you in a more structured way with the help of practical scenarios and case studies at the end of each module that you will gone through during the course. Apart from the course syllabus and different case studies, your knowledge and skills will also be evaluated through a comprehensive online exam. After successful completion of the course, candidates will be awarded with the prestigious Java Web Services certification from Brainmeasures to admire their knowledge and skills that they will enhance during the course. Ultimately, certificate will be an added point of IT and computer programming skills in your Resume that will lead to increase your earnings or for getting better employment opportunities. As, it is more demanding field in web based services management and applications development in IT and computer science, so earning your Java web services certification is also a major help when it comes to making significant changes on the level of your income. The expected average annual salary is about $82,000 per year which can be grown in between $97,000- $135,000 based on level of expertise, experience as well as reputation of the employee and organization in the relevant field. 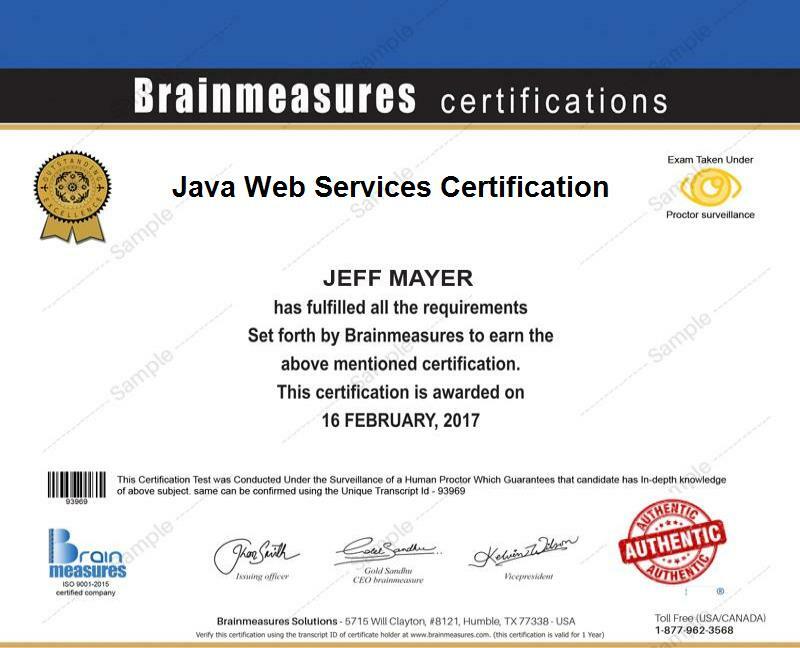 Brainmeasures Java Web Services certification program is not just limited for those who have prior knowledge about web applications and service as well as technical expertise if using object oriented programming. Anyone can take this course based on his/her interests and planning to take advantage of the Java programming language with web services applications. It is most suitable for software engineers, IT managers, programming architects, programmers, web developers, web designers, web services providers, web programmers and any other professionals who are greatly interested about integrating useful Java applications all over the web.